Why should you buy your Custom Awnings & Shades from us? When you buy from us, what you have is the final product – a custom manufactured awning of the best quality at an affordable price. The frame is comprised of 100% Galvanized Steel to prevent rust and painted to match the color of the fabric. The primary awning fabric is Sunbrella, which has an attractive canvas appearance and an industry leading warranty of 10 years. The thread used on all seams is a Gore product called Tenara, which is the same thread often used by NASA. We custom build all of our awning frames using galvanized steel. Galvanized steel is different from regular “black” steel in that it is hot dipped in a pool of boiling zinc. The zinc adheres to the steel, cools and hardens to form a rust inhibitive finish. Some of our competitors use regular “black” steel to save money, which means you do not have a rust inhibitive finish. When the awning frame begins to rust and that rust gets on the fabric all fabric warranty will be void. Sunbrella – Our first choice for canvas awning material, Sunbrella fabric offers excellent fade and weather resistance. Water repellent. Guaranteed for 10 years against loss of color or strength from normal exposure conditions. Cleaning instructions and warranty information available. Textilene/Sunsure – Our first choice for shade screen material of 70-90% blockage backed by a five-year manufacturer’s limited warranty. Textilene/Sunsure is made from polyester yarns that are individually coated with PVC, woven and heat set. This mesh fabric is unmatched for its combination of strength and beauty. Durable and long-lasting, Textilene/Sunsure is ideal for applications that require high tensile strength along with breathability and flame resistance, such as Roll Curtains, Lace-On Panels, and Shade Screen Awnings. The fabric is highly resistant to rot and mildew, colorfast, easy to clean and quick drying. There are several other textiles available by request. Please call for any additional information pertaining to a specific fabric: (602) 254-8500. The most common problem that results in an awning having to be recovered is caused by the thread deteriorating. Our awnings are stitched together using GORE™ TENARA® Sewing Thread. Once again, we stress that any awning or shade structure you purchase from American Homesteader Awning and Shade Inc. or one of our over 20 wholesalers will be among the best quality raw materials used in the industry! GIVE YOUR CLIENTS THE BEST. 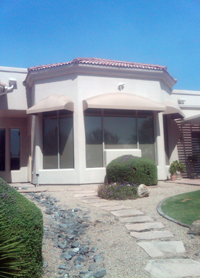 Choose American Homesteader Awning and Shade Inc. We are your Phoenix AZ awning manufacturer, sales & installation specialist of custom-made awnings, roll curtains, window and entrance canopies, and shade structures. Custom awnings and shade structures for Phoenix metro, Scottsdale, Surprise, Cavecreek, Carefree, New River, Anthem, Tempe, Mesa, Tucson, Prescott, Goodyear, Apache Junction, CareFree, CaveCreek, New River, Camp Verde, Sedona, Flagstaff, Payson, Peoria, Sun Cities and Avondale Arizona!